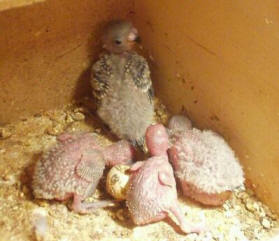 Breeding budgies is easy, as long as the proper environment and housing are provided. Budgies normally breed best in the spring and early summer. There are two ways to breed your bird: selective cage breeding or colony breeding. Selective cage breeding involves a single cage with one pair of birds per cage. This way, the father of the newborns is assured and you can attempt to pass on specific positive traits. Once the birds are placed together in a cage, a budgie nest box is attached. These nest boxes are available in many different styles at pet stores. It is very important that a nest block is also available. This is a piece of wood with a concave section carved out, in which the hen can lay her eggs. Without proper housing and nest boxes, budgie breeding is difficult, if not impossible. The other breeding method is colony breeding. This type of breeding is best done in an aviary. Several pairs of birds are put together and multiple nest boxes with nest blocks are placed throughout the aviary. In this situation, the birds are allowed to choose their own partner and the father of the babies is not easy to determine. This type of breeding is closer to natural breeding but requires a significant devotion to the breed. An aviary can take a lot of time and effort and much thought and preparation should be done prior to establishing an aviary in your home. Regardless of the method used, clutch size is normally about five eggs that hatch about 18 days from the time the hen starts sitting on the eggs. The female incubates the eggs and handles most of the feeding of newborns until they are weaned.